The first time you derez a piece of ice each turn, gain 2credit. Does Keros Mcintyre gain 2 if the Corp derezzes a piece of ice? How do the players know if the Runner or the Corp is responsible for the derez? Unless otherwise stated in the card text, the player who owns the card is always assumed to be the owner of any abilities on that card. Keros Mcintyre's ability only triggers if the Runner is responsible for the ice being derezzed. If a Corp card derezzes a piece of ice (e.g. 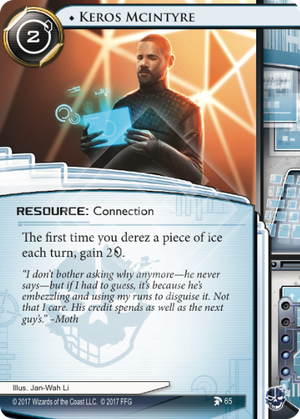 Test Ground), or if a Runner card tells the Corp to derez a piece of ice (e.g. Muertos Gang Member), then Keros Mcintyre does not trigger. Insult to injury for derezzing decks. He's unfortunately unique (criminals would love a few clones of him, but Jinteki wouldn't play ball). Other than that though there's very little not to like. The install cost of 2 is paid for the first time you derez ice with him installed, possibly even in the same turn as you install him. Since there's very little to analyze about his ability on itself lets look at the options for derezzing ice. * means will rotate out soon once the first pack of the cycle after Red Sands hits. Brute-Force-Hack - Double, pay rez cost off ICE to derez it. Crescentus * - 1, to derez ice just broken with any breaker. Emergency Shutdown * - After running on HQ derez a piece of ice. Exploit - After running all centrals derez 3 pieces of ice. Flashbang - Derez a sentry being encountered. Golden - 2 and pop back to grip to derez ice just broken with this breaker. Leave No Trace - Derez ice rezzed during a run. Maxwell James - After running on HQ to derez ice in front of remote. Peregrine - Golden for code gates. Rubicon Switch - + rez cost of just rezzed ice to derez. Saker - Golden for barriers. Certainly no lack of options. The old ones (Crescentus and Emergency Shutdown) are powerful but obviously not the way forward. Exploit is cool if you can pull it off but doesn't work well with Keros since it's a high cost to derez 3 but you only get credits for derezzing one. The rest works pretty well with Keros. One card in particular stands out however: Rubicon Switch. You can only use it once per turn but Keros only gives money once per turn and the effect of combining the two is a 2 discount on Rubicon Switch. With a decent enough economy that can make life really annoying for the corp.
A bird lady deck can also use Keros pretty well. At the very least you get back the money needed to make one bird return to the nest each turn. From a deckbuilding perspective Keros is easy. If you derez ice often enough he's very good economy, if you don't he doesn't do anything and thus can be left out.